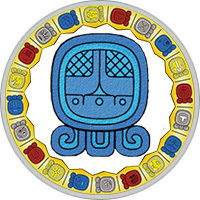 Mayan Name: AK´AB´AL / Akbal. Meaning: Night, Darkness, Home, Sleep. Compatibility: Night, Deer, Monkey, Eagle, Storm. Sign of Night (Akbal) — all-consuming darkness, solitude. The meaning of the sign is the underworld, the night, the world of dreams. The patron of the sign is the God of the underworld. The ancient Maya believed that wisdom can be found only by facing internal demons — fears. Each person must make a trip to his "house of darkness", where after experiencing spiritual death, he can be reborn. Akbal — a sign of the highest wisdom, reflects the desire for renewal, spiritual rebirth. Night is a sign of luck and tests that must be overcome on the road to success. People of this day all their lives try to achieve harmony, trying to get the better of internal fears. Cleverly combine contradictory qualities: uncertainty and strength, resilience and generosity, concentration and dreaminess. True ability to maintain a reasonable balance, to maintain dignity in any situation is not so easy. The reserved person is full of emotions, which he carefully conceals, painfully perceives criticism and remarks. Has a rich imagination, finds solace in fantasies and dreams. Hard-working people of the sign of Night persistently achieve their goals. Usually they reach unprecedented heights in their careers, but not at the expense of luck and luck, although it is not necessary to completely discard these important components of their success. They work hard and give themselves to their favorite business. Independent people who are courageous in their actions are considered excellent leaders. They successfully solve financial problems, maintain good relations with employees. Try to contain their experiences, so behave calmly and benevolently. Person Night has a reputation as an excellent specialist, a true professional in his field. In love there is no more faithful and reliable person than a representative of this sign. Subtle sensing people of the Night, who have intuition, are able to understand the sorrows and anxieties of a partner. In return, they are waiting for love and devotion, they are extremely sensitive to even the slightest lie. Torn by suspicion people can not show the best character traits: suspiciousness, isolation, resentment. They desperately need a faithful, reliable person. In a romantic relationship, they seek peace, appeasement, avoid excessive passion. But they adequately overcome the hardships of life, they think that difficulties only strengthen relations if partners experience a real feeling. Man Night is a low-key person who prefers to hide his real experiences and emotions. His calm calmness, the ability to clearly express thoughts give him a strong personality. It seems that the man is not subject to fears, he is not tormented by doubts. Surrounding people are not given to understand his true thoughts. He tries in vain to achieve equilibrium, to find inner harmony. Life tests only temper his character, although often disappointed in people, loses interest in what is happening around, is locked in itself. But such behavior is more likely an exception: the man of this sign is a generous, kind person, always standing up for the protection of weak people. Unconfident woman Night is inclined to exaggerate even the most minor problems. The hypocritical, touchy nature in each event looks for a dirty trick, believes that great trials have been sent to it. With the support of close people, it can overcome internal fears, gain strength and confidence. Has all the qualities that can lead her to success: strong intuition, perseverance, reliability. But, unfortunately, does not find use of the abilities that generously endowed her nature. Too thin, sensitive nature needs love and care of loved ones.